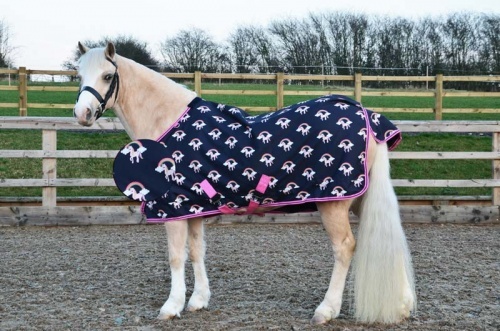 Hy Unicorn Lightweight Standard Turn Out Rug. Start the season in style and beat the rain with this fun Navy with Pink Unicorn print lightweight turnout rug. Made from 600 denier rip stop waterproof material, the 0g fill rug is secured with two surcingle type closure breast straps, cross surcingles, leg straps and a fillet string.